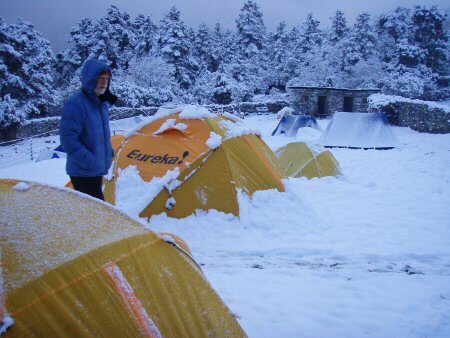 Although the sky had been clear at least intermittently at night, when morning came there was a few inches of snow on the ground, on our tents, on everything. It was announced that we would not move upward, but would stay another day at Deboche. So far, we had been on track, more or less, to follow our original plan of hiking to Kala Patthar and then crossing Cho La pass into the next valley. The snow changed all that. It meant that the pass would be closed, if not to us, then to the yaks that we depended on. We could still go to Kala Patthar, weather permitting, but not over any of the high passes. Still, the snow did not mean we could not leave camp. Up ahead was another famous monastery: Pangboche. 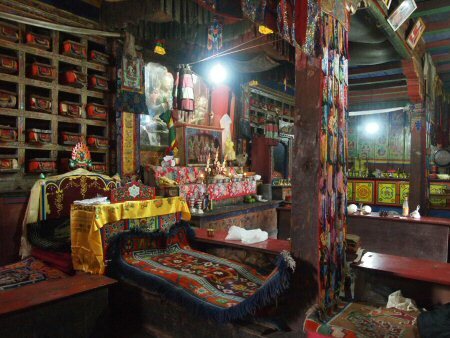 Where Tengboche is the largest, Pangboche is the oldest monastery in the region. 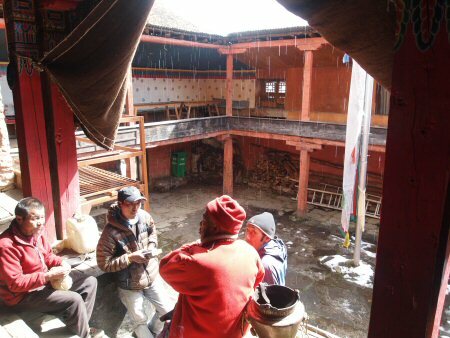 We traveled as a group, since none of us had been much beyond Deboche. I hurried along, trying to keep warm. The snow was thick on all the branches, and as the tallest I received more than my share of snow down the back of my jacket. I was using my hiking sticks for the first time this trip, and they came in handy for knocking snow off the trees and bushes. 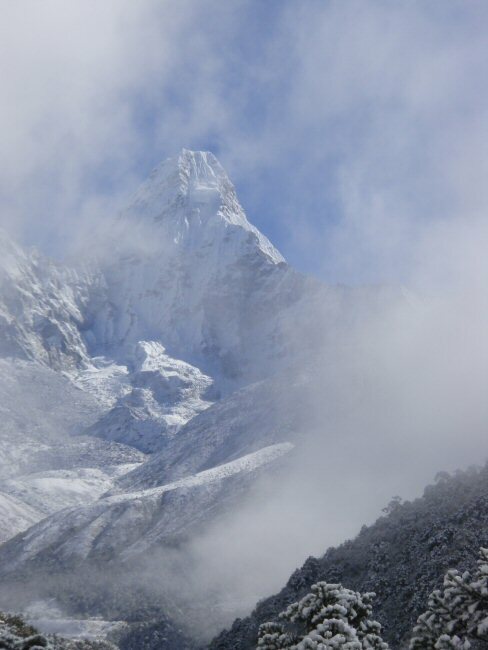 Before long we arrived at Pangboche. Or at least we were at the lower end of it. The monastery is at the far upper end, several hundred feet higher. The monastery was set up similar to the others: an outer courtyard and a inner sanctuary beyond. We all took off our shoes and entered. It was smaller and simpler than Tengboche. There was a large collection of sacred texts, and a much more modest set of statues. As before there were rows of benches with robes, drums and horns ready in the back, and food offerings set out. The monks were performing some ritual in the courtyard, which involved burning some juniper branches. It made a wonderful smell, but I had to get away from the thick smoke. The weather in the morning was unstable: patches of crystal clear blue skies, alternating with light snow, sleet, and rain, turning to thick clouds and low fog. I wondered if this meant that we would be stuck for another day. In the afternoon, instead of going out again into the damp, I went up to the dining room above our camp, basked in the feeble warmth of the stove, and wrote in my journal. I was happy to get an additional rest day: I was in no hurry to go higher.